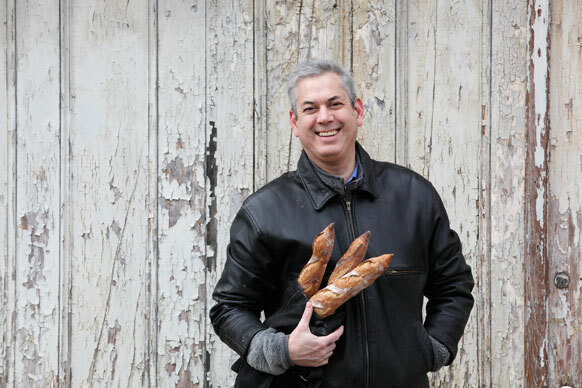 Sam Fromartz never planned to write a book about bread. A freelance business writer, he enjoyed baking because it seemed like “the antithesis of writing—my version of chopping wood, crucial to maintaining my sanity amid the daily pressures of work.” But in 2008, with the economy tanking and the freelance market in freefall, he landed an assignment too tempting to refuse: 10 days apprenticing with a professional Parisian baguette baker. On returning to his own kitchen in Washington, DC, he was consumed by the desire to replicate those Parisian baguettes. Tinkering with every variable, he made batch after batch until his baguettes were so good that, in a blind tasting judged by professionals, they beat the city’s best artisan bakeries. They also drew the attention of food maven Alice Waters, who recruited him to bake the breads for a $500-a-plate charity dinner. Sam had long since turned in his profile of the Parisian baguette baker, but his quest for the ideal alchemy of yeast, flour, salt, and water had just begun. He made sourdough starters from figs, wheat bran, and sprouted barley. He experimented with whole wheat and rye flours and ground his own buckwheat, barley, and spelt. He visited American wheat farmers who are reviving heritage varieties such as Turkey Red, and went to Berlin to grapple with the intricacies of rye dough. He spent days baking with a French paysanne boulanger (peasant baker) who grows and mills his own organic wheat, in defiance of rules that require farmers to plant only seed sold by agricultural companies. His curiosity is wide-ranging, ensuring that even non-bakers will learn something of interest as he toggles effortlessly between the behavior of protein molecules and Pliny the Elder’s discourses on fermentation. Primarily, however, he is deeply invested in helping bakers make that perfect, Platonic loaf. He offers nine recipes, from an easy emmer flatbread to a challenging Roggenweizenbrot (rye-wheat bread). Nine recipes may not sound like many, but baking can be a multi-day process, and even experienced home bakers will benefit from his step-by-step instructions and hard-won trouble-shooting tips.